This store has a great collection of links to Washi Paper and the various products made from it. The oldest printed matter existing in the world are the "One Million Dharani Charms" of Japan. In the year 764, the Empress Shotoku, praying for peace throughout the nation, sanctioned the printing of a million paper prayers, each prayer to be enshrined in its own individual three-storied wooden pagoda with a height of 13.5 centimeters and a diameter of 10.5 centimeters at the base. Printed Buddhist prayers called Dharani were placed in a hole in the center and 100,000 each of these pagodas were allotted to ten great temples, including the Horyuji Temple of Nara, Yamato Province. At a time when paper making techniques made a rapid advance, the Japanese people were not satisfied with simply paper on which words could be written and which could be preserved well. They demanded a special harmony and beauty, depending on the use and the taste of the user. Just for "irogami" (colored paper) and "tanzaku" (strip of fancy paper for the writing of poems) alone, many different kinds were made, ranging from the ornate to the simple, to match the poem's content and calligraphic style. The complex demands were fully met by the paper making artisans. Washi was often used as a gift among the upper classes of society in ancient times and the Middle Ages. For instance, when members of the nobility visited each other, it was customary to take along white paper of high quality. This was presented with the thought that the person visited was a man of culture-so please use this for composing poems or copying a sutra." This refined custom continued until recent times. Even on the battlefield, it was considered good taste for a warlord to carry thich Washi called "hikiawase" with him. The original meaning of "hikiawase" was the place for tightening body armor. It was usually located on the body armor's right side. Warriors found it convenient to put paper and writing equipment here and it was from this that the name of the paper originated. Besides for official communications, the paper was used for writing poems, miscellaneous notes and records. Eventually the uses of Washi spread beyond writing, painting and printing. Washi was the first paper in the world to be employed widely for daily necessities. Washi imparted many benefits and had a splendid practicability in the life of the Japanese people as a whole. When well used Washi is torn into a ribbon-like form and twisted with the hands, this becomes what is known as "koyori." It is generally used as a string to bind sheets of paper. In addition, a large number of "koyori" can be combined in different shapes and lacquered for "koyori handiwork." The many kinds of "koyori handiwork" such as bowl, plate, cigarette case, lunch box and "kori" (hamper with cover for containing clothing-made with consideration for ventilation) are lightweight and splendid craft work. It is a traditional industrial art born out of the attachment felt by people who did not want to waste even a fragment of Washi. Another informative page about Washi Paper. Washi is the Japanese word for the traditional papers made from the long inner fibres of three plants, wa meaning Japanese and shi meaning paper. As Japan rushes with the rest of the world into the 21st Century, and more modern technologies take over, machines produce similar-looking papers which have qualities very different from authentic washi. As of the fall of 1994, there remain roughly 350 families still engaged in the production of paper by hand. As time goes on, modern technology replaces much of the traditional process. Still there are those papermakers left who will not compromise. According to the Japanese, "Things of excellence shall not die." 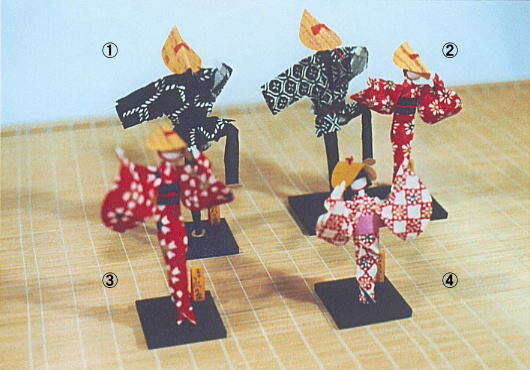 Uchiumi made a show of washi puppets relating to the life of Kuukai, Kooboo Daishi (Kukai, Kobo Daishi). There is a Museum with the Sculptures of Uchiumi san. 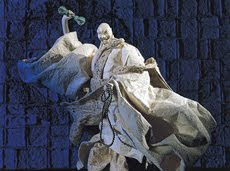 This museum exhibits Japanese paper carvings and sculptures of Mr. Kiyoharu Uchiumi. He has reproduced some scenes from the Tales of Genji, which is the masterpiece written by Murasaki Shikibu in the Heian period.Mr. Uchiumi's aim is that visitors appreciate his works with all their five senses. Lighting and music complement and allow full expression of his works The entire exhibition hall is a big stage, and the spectators walk by and appreciate individual scenes on the stage.
. Asakusagami, Asakusa-gami　浅草紙　. Legend has it that about 1,500 years ago a woman taught people in this area how to make paper with the natural materials from special plants for washi called Kozo, because she had sympathy on them since they did not have any rice fields to make a living. She mysteriously disappeared to the upper river, so she was named "Kawa-kami Gozen", meaning "upriver princess" in Japanese. Since then, the princess has been enshrined as a paper goddess with two local gods in Okamoto Otaki Shrine. They say she might have been from Korea or China. Around that period, there had been many people from China passing through Korea to bring their techniques to Japan, which later became the present Japanese handcrafts. The Fukui accent is very similar to the Korean one, due to the fact that Fukui was one of the main locations Koreans could first land on naturally with the strong tide of the sea. When they landed, they only found a vast swamp, which made it difficult for them to settle in. As a result, they went to the surrounding mountain valleys to live. These locations are the origins of where pottery, lacquerware, knives and Washi (Japanese traditional paper) are made, according to some studies. Since then Washi has been a main industry in the Echizen area. There are now about 70 factories that use either handmade, industrial, or processing methods, with about 500 people working in Washi related jobs in the Imadate area "Goka". "Goka" is called by five villages of the town, Oizu, Iwamoto, Shinzaike, Sadatomo and Otaki, in all together. This area have been producing Japanese paper since 6th century and constitute "Echizen Washi no Sato". There used to be lots of paper villages every where in Japan, but it is veryunusual to see an area like Echizen only making paper through all the year, whereas the others used to make paper only in winter when they didn't producerice. As a result, Echizen is one of the largest handmade paper industries in Japan along with Tosa in Kochi and Mino in Gifu Prefectures. The Royal family sometimes uses Echizen Washi to announce their baby’s birth with their names on it. Here, there are many old people interested in Echizen Washi history and keep studying with the old documents by themselves. The above-stated are from my own studies taught by some of them. Now I am studying about the exported paper from Echizen during the edo period, when the central government closed most of the ports but Nagasaki only open to China and Holland. Inshu, also called Inaba, is the feudal name for an area that today lies in the eastern part of Tottori Prefecture. Today the production scale of Inshu washi (Japanese hand-molded paper) at two towns of Aoya Town and Saji Village in east Tottori Prefecture is second in Japan only to that of Echizen washi in Fukui Prefecture. In a region blessed by top-quality water that comes from crystal-clear streams deep in the mountains, the successful history of Inshu washi stretches back more than 1,000 years.
. Folk Craft and Art from Tottori . 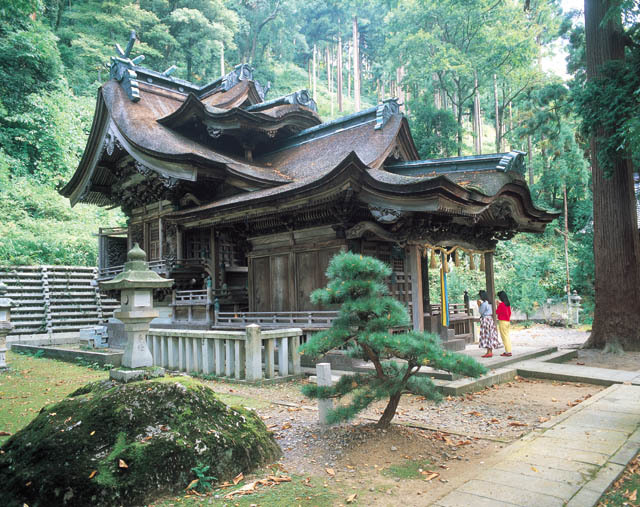 The Izumo region, in the West part of Japan, has been documented as a paper production area since ancient times. Former Living National Treasure Eishirou Abe built upon this local tradition, and with the counsel of the founder of the Folkcraft Movement Soetsu Yanagi, established Izumo Folkcraft Paper. Currently, the spirit and skill of Eishirou Abe has been passed to his grandsons, Shinichirou and Norimasa Abe. ..... In 1983, Mr. Abe established "Abe Eishirou Memorial Hall", where a wide and varied collection of literature and materials related to Washi, and many items made of Washi are exhibited. Next to the Hall is the Washi Denshusho Hall where individuals can personally experience the Japanese handmade papermaking process. 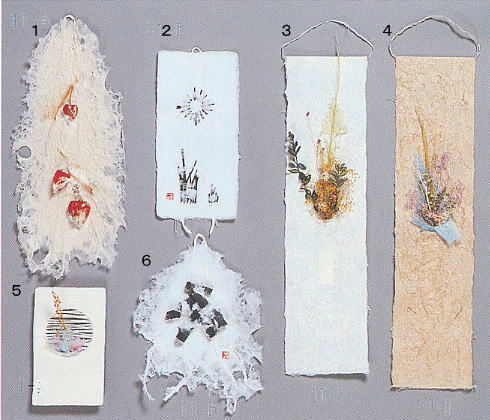 In Japanese papermaking, a wide variety of fibers are used, but originally, fibers such as hemp, kozo, and gampi were prevalent. During the Edo period (1600-1868), mitsumata began to be used, and currently, kozo, mitsumata and gampi have become the typical fibers used for Japanese papermaking. Other suitable fibers for papermaking include straw, kuwa, bamboo, and wood pulp. Also, in recent years, the use of imported Thai kozo, Philippine gampi, and Manila Hemp (Abaca) is increasing. The decrease in papermaking households has also happened here in Yakumo-cho; this area which used to have approximately 30 mills has now shrunken to just our house, Izumo Washi. The strong washi paper from Izumo was especially liked for shoji.
. kami 紙 paper art and craft .
. Regional Folk Art and Crafts from Japan . Kaishi 懐紙 folded paper, "pocket paper"
The Yamasato and Kurotani areas, rich in Kouzo (paper mulberry) and clean, fresh water that form the raw materials of Washi (Japanese traditional paper), have upheld traditional paper making skills for over 800 years. They continue to preserve the craft today. (Designated Prefectural Intangible Cultural Asset)In the region, the drying of Kouzo, and paper made by drying in the sun can be observed. 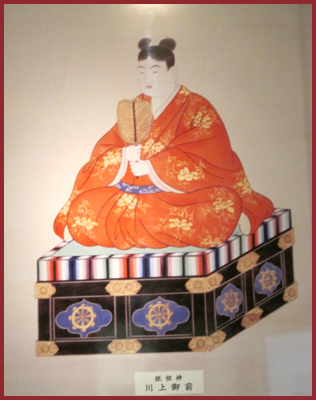 Buddhism and papermaking were introduced to Japan from China around 1400 years ago. Kurotani is a papermaking town near Kyoto. Today washi is used for books, woodblock prints, wrapping, and clothing. A quick look at the papermaking process in Kurotani is shown on this web page. Japan is well known as a centre of paper production. Kochi is one of Japan’s premier paper-making locations. 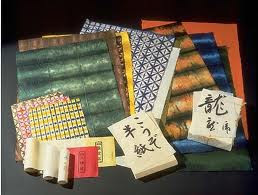 Tosa-washi is the paper produced in Kochi and has a 1000-year history, with records showing that is was presented as a tribute to the emperor. Tosa-washi is known for its high quality and artistry, and this industry is still active today. The industry has diversified to now include industrial paper for use in electronics. Rogier Uitenboogaart is a Tosa-Washi artist from The Netherlands who has settled in the mountains of Yusuhara Town, in western Kochi. Japanese paper *washi 和紙 originally made from mayumi 檀 fibers (the spindle tree, euonymus sieboldianus) but now made from the fibers of the mulberry tree kouzo 楮 (see *choshi 楮紙), or a mixture of the two fibers. Often called michinokugami 陸奥紙 because it was produced in Michinoku area (part of modern day Touhoku 東北) during the Heian period. White or light brown, the early version of the paper was smooth but later danshi is noted for its slightly wrinkled texture. first appeared around the fourteenth century in the Echizen Province of Japan. is kozo paper. Mulberry is actually the Western name for the plant from which the kozo fibers are derived. is a paper made from kozo fiber, but it does not resemble any of the other kozo papers. Gasen, which originated in China, is the oldest type of Oriental paper still used for artwork. Torinoko means "child of the bird," or "egg,"
and its surface resembles an eggshell. It was introduced around the eighth century, and was made of pure gampi. is the least absorbent of all the papers and the easiest for a Western watercolorist to work with. They revived an old method of making local paper in a village that invites artists to boost its attractions. hanagami はながみ【鼻紙】"paper to blow your nose"
Mulberry pulp, kozo or mitsumata pulp and other basic pulp substances for washi, Japanese paper, are mixed with local clay to make stronger dolls. Sometimes even old newspapers are torn and used for the mix. It was after coming across this haiku poem by Takahama Kyoshi that I first started to wonder about yuton. I found out that yuton were made of paper, but what sort of paper product could have a surface so shiny that it would even reflect the pillars inside a house. I wanted to see one for myself, so I went looking. First of all I tried to find out something more about them. The Kojien dictionary briefly defines a yuton as a mat made of sheets of paper glued together and coated in oil or urushi lacquer which is used as a floor covering in summer. The Washi Bunka Jiten (Paper Culture Dictionary) by Wagamido Publishers, says something very similar only adding that some yuton have pictures painted on them. The Parkes* Nihonshi Chosa Hokoku ("Japanese Paper Study Report") names Yamato (Nara) as a major place of yuton production. His "Trading Notes" list places where yuton were made as Nonoguchi in Yoshino, Nara Pref., Fukui City and Tojiki-gun, Fukui Pref., Chita-gun, Aichi Pref., Kitagamahara-gun, Niigata Pref., Kumagaya in Saitama Pref., and also Tokyo. So I was able to learn that yuton were once made in various parts of Japan. The craftsmen paste together about 13-15 layers to make a yuton. One person applies glue while the other pastes down and beats, a job that requires skill and precise team play. And there is no room for error in the amount of glue applied to each sheet. This has been the wives¡ job for generations. The one who pastes down the paper must stand on top of it to work. He cannot do this barefoot because any sweat would damage the surface, and he cannot wear slippers because they do not have enough traction. The footwear of choice is sandals made of bamboo skin. There is a fine art in ensuring that each piece fits as perfectly as possible without any overlap at the edges -- a skill in which Mr Makino was trained endlessly by his father. Even with a mat as big as eight-mat size -- 360 centimeters square -- Mr Makino can keep his overlap within 3 mm. Quite an achievement. And he does this without drawing a single line to keep the paper straight, just using his eyes and his craftman's instinct to guide him. They say in handcraft that the simpler the task, the harder it is to do well, and this is certainly the case with yuton. Such precision is indeed the very basis of fine hand craft. Traditional Japanese hand-made paper has been shortlisted by a UNESCO preliminary review panel for possible inclusion on its Intangible Cultural Heritage list, the Cultural Affairs Agency said Tuesday. Based on the panel’s recommendations, the U.N. Educational, Scientific and Cultural Organization’s Intergovernmental Committee will decide in Paris in late November on whether to list traditional hand-made paper from Saitama, Gifu and Shimane prefectures. Paper used for writing and painting; for documents, classical books, Buddhist sutras etc. Ryoushi used in Japan includes *mashi 麻紙, *choshi 楮紙, *ganpishi 雁皮紙, and *mitsumatagami 三椏紙. Mashi, is made from yellow or white hemp and was widely used as the paper on which to copy sutras, particularly in the Nara and early Heian periods (8-9c). Choshi, which is made from the abundant mulberry tree that grows in all regions of Japan and produces tough paper fibers, is the predominant paper in use since ancient times. It includes several varieties: *housho 奉書, *minogami 美濃紙, and *danshi 檀紙. Ganpishi (also known as *torinokogami 鳥の子紙 or "chicken paper" because of its yellow color), is a very fine quality paper with a smooth, glossy surface made from plant fibers (Diplomorpha sikokiana), and often used for book production since ancient times. From the late Muromachi period (mid-15c) onwards it was usually used for documents. Thick varieties, *atsuyou 厚様, and thin varieties, *usuyou 薄様 also were produced. Mitsumatagami, made from mitsumata 三椏 plant fibers (Edgeworthia papyrifera) was developed in the mid-Edo period (18c), but was generally not used for books or documents. A full single rectangular sheet, *zenshi 全紙 of ryoushi, when used horizontally, is known as tategami 竪紙 (also written 立紙). When this is folded in half horizontally it is called origami 折紙. When it is folded in half vertically it is called tateorigami 竪折紙. A sheet which is folded both horiziontally and vertically and then cut into smaller pieces is called kirikami 切紙. When a piece of writing cannot be completed on a single sheet, two or three sheets are glued together and this format is known as tsuzukigami 続紙. Ryoushi has a wide variety of uses including: letters, cards, envelopes, books *sassubon 冊子本 and scrolls *kansubon 巻子本. A wide variety of decoration can also be applied. Nancy Broadbent Casserley is an independent scholar and curator in the field of the History of Design. This paper was also used on the shop-sign. Their shop-sing was a miniature fire watchtower (hinomi yagura　火の見櫓). The oil to impregnate the paper came from a special tree, aburagiri 油桐 "oil-paulownia", Tung tree (Vernicia fordii). The Kappa makers had to prepare the paper first, mostly using strong Washi made from koozo　楮 fibers of the mulberry tree. The paper was first impregnated with kakishibu　柿渋 persimmon extract and then coated with Tung oil. On top of that other colors could be coated or letters painted. Many Kappa makers also sold this special paper for others to use when repairing umbrellas or raincoats. which was introduced by Kobo Daishi Kukai according to Chinese know-how. This paper was also used for hand fans.